Digitally enhanced footage with complete journey captioning ! 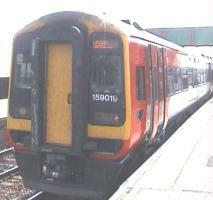 A cab ride aboard a Class 159 3-Car Unit of South West Trains from Plymouth to London Waterloo via Ivybridge, Dawlish & Templecombe. Ivybridge, Totnes, Newton Abbot, Teignmouth, Dawlish, Exeter St.David's, Exeter Central, Whimple, Fenton, Honiton, Axminster, Crewkerne, Yeovil Junction, Sherborne, Templecombe, Gillingham, Tisbury, Salisbury. Here a further six cars are added making a 9-Car Unit for the remainder of the journey to Andover, Whitchurch, Basingstoke, Woking & Clapham Junction terminating at London Waterloo.